So we went skiing and snowboarding on Sunday to catch the last of the snow here in California. It was amazing, Little D totally got the hang of it and is a little ski bunny now, which makes my heart beyond happy, but more on that some other time. It was similar to the bike riding thing. Which you all know about. I really didn’t want to stop at Starbucks on our way out of town at the crack of dawn and spend $20+ on sugar-filled, highly processed breakfast treats. I really didn’t want my kids to feel scammed out of a nice Sunday morning breakfast by throwing a few granola bars their way. And I really wanted them to eat zucchini. In some way, shape or form. These muffins were the answer I was looking for. Per usual, I found a great recipe on How Sweet It Is for quick, easy, delicious muffins that were the perfect early morning fill-me-up for our whole crew. They were soft and not too sweet and filled with goodness (all whole wheat flour!) and I am planning to make them again and again, especially since Kai said there “are pieces of grass” in his muffin…and he still ate it up. In a bowl, whisk together flour, baking soda, salt and cinnamon. Set aside. Line a muffin tin with liners. In a large bowl, whisk egg and brown sugar together until smooth and no lumps remain. Add in vanilla extract, butter and milk, whisking again until smooth, then stir in zucchini and mashed bananas. Gradually add in dry ingredients, mixing until just combined. Fold in chocolate chips. Fill each muffin liner 2/3 of the way full with batter. Bake for 15-17 minutes, or until tops are no longer wet and become slightly golden. Remove and let cool until comfortable to the touch. I tried these but with white flour (did not have wheat flour on hand).. They were very yummy and healthy. My kids (2 and 4) gobbled them up. I think the chocolate chips had something to do with that. Will try them again. I just made these muffins for a breakfast play date with moms and toddlers. Great recipe! Everyone loved them, as evidenced by the leftover chocolate beards. Will definitely make these again. Glad you enjoyed! Thanks for sharing! 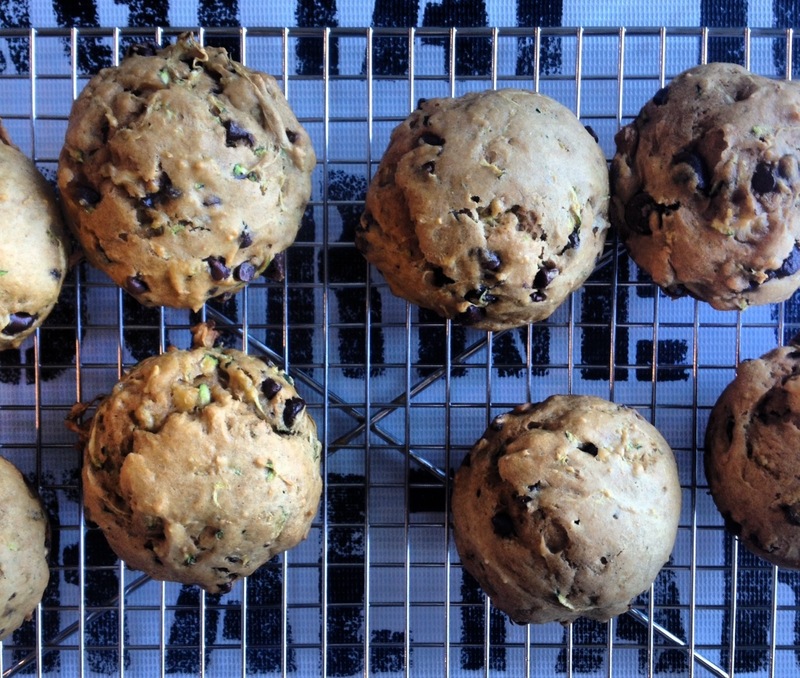 Will be trying this on Saturday morning….Love a weekend muffin! Your recent blueberry post inspired me to make the GP blueberry muffins and they were Ammmazing! Thx. Nice, let me know how they turned out! These sound perfect! I’m on a quest to eat better. And feed my kids better too!